Preheat the oven to 350°F. In a large bowl, combine all the wet ingredients: Guinness, milk, vegetable oil, and vanilla. Beat in the eggs, one at a time. Mix in the sour cream (don’t worry, you can’t taste the sour cream). In a separate bowl, whisk together the dry ingredients: cocoa, sugar, flour, and baking soda. Gradually mix the dry ingredients into the wet mixture. Place baking cups into pan. Fill half way up with Guinness mixture. For each cupcake, you will need to make three balls of aluminum foil 2/3 inch in diameter. 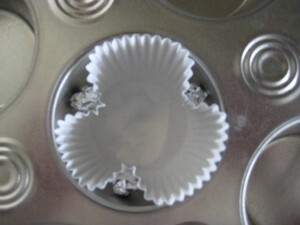 Place the foil balls between the paper liner and the pan equidistant around each cupcake. 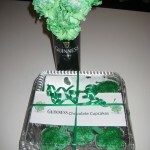 The foil balls will create the shamrock shape. Bake 25 minutes. Makes 24 cupcakes. Blend together cream cheese, butter, and confectioner’s sugar. Beat until light and fluffy. Slowly add in the Bailey’s, and beat until completely incorporated into the frosting. 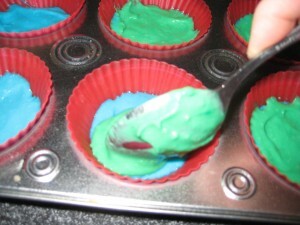 Add green food coloring and blend until you have the desired color of green. Using a spatula spread the frosting on top of the cupcake. Be careful to keep the frosting within the paper liner so you don’t lose the shamrock shape. 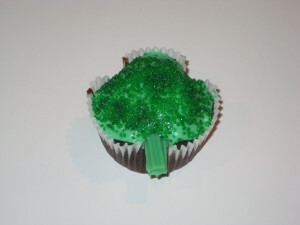 For the stem, cut the green licorice into 1 inch pieces and insert into the cupcake. Top with green sprinkles if desired. 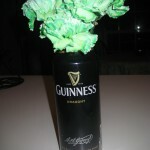 I couldn’t let the cool looking beer can go to waste, so I bought a few green carnations from the store and used the can as a vase. 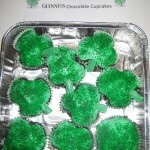 It added to the Irish spirit as friends came by to grab a yummy cupcake. This project makes the most adorable cupcakes. 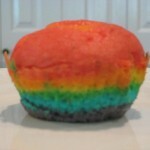 You will need some patience to make all 24 cupcakes in this rainbow fashion. Children over 6 may enjoy this project but don’t expect perfect cupcakes. Seeing and eating the finished product is the most fun part of this project. Prepare your favorite white cake mix. 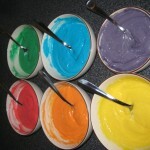 Divide the batter evenly among six small bowls, about 1 cup for each color. Using the guide below, add food coloring to each bowl of cake batter and mix well. Drop in the cupcake liners into the pan. Using a small spoon add a ½ teaspoon of the purple batter and spread around the bottom of the liner. Make sure the batter is level and touches all around the sides of the liner. Next add a spoonful of blue batter. Tilt the spoon on its side and pull the batter to the side of the liner being careful to not allow the purple to mix with the blue. I found it easier to spin the pan instead of twisting my arm around (a little trick I learned from cake decorating class). Continue adding each color in the following order: green, yellow, orange, and then red. Bake as directed on the cake box (probably about 20 minutes). Allow cupcakes to cool and the remove liner. 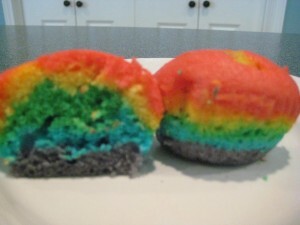 It is like magic to see the rainbow throughout the cupcake. Top with frosting as you desire. You can also use this idea to make a fun and exciting birthday cake. Be sure to only frost the top so the rainbow sides are displayed. A friend sent me an article all about Groundhog Day cupcakes that I had to share. There are some great ideas. Take a look at the pictures and you can dissect each part and find candies and cookies that can turn into a groundhog with a little creativity.